David Ambrose is a co-founder of Art Not War and has spent the past 15 years producing and directing. He oversees all production, post-producing, analytics and social listening for Art Not War’s content. His works have earned over two hundred million online views, 6 Pollies, 3 Reed Awards, and hundreds of millions of dollars of earned media through worldwide news coverage. In 2009 David executive produced the feature film, Monogamy, winner of Best Narrative at the Tribeca Film Festival. In 2015 David directed Upworthy’s most popular piece of original content, Pay It Forward Pizza which earned over 50 million views. 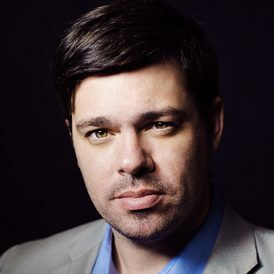 In 2016 he produced and co-directed the feature documentary that predicted the outcome of the presidential election based upon voter suppression. The film has been screened in 80 cities and cited in lawsuits by the ACLU, Common Cause, and League of Women Voters. Currently, David is an entrepreneur in residence at Civic Hall in New York where he is developing a video sharing platform for crowdsourcing video stories called Onstack.